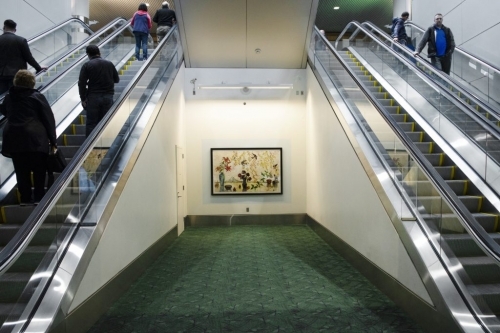 The PDX Art Program is pleased to present a truly unique and masterful monotype by Portland artist Kim Osgood, now on view pre-security within North Baggage Claim through September of 2019. Aptly titled Embracing Earth and Sky, this large-scale evocative print embodies and celebrates the iconic geography, flora, and fauna of Portland, Oregon and the surrounding bountiful Pacific Northwest region. Embracing Earth and Sky ties together elements of fall-lilies and yellow birch leaves, and pomegranates, persimmon, and late season blackberries, along with little pieces of my daily life, including paint brushes and the view of Mt Hood from my neighborhood. They are icons that fill my work and my life. An icon is a visual form of prayer that seeks to inform us about the spiritual world. For me, painting is an act of prayer and meditation; everything is connected with the source of all life. Trees with their branches reaching towards the sky and roots deep in the earth are links between the earth and heaven. Kim Osgood has exhibited her artwork since the mid-1980s. Osgood’s work has been part of exhibitions including the Oregon Biennial, Portland Art Museum; PICA; PVCA; Washington State University, Pullman; and Coos Art Museum, Coos Bay, Oregon. She studied at Skidmore College in Saratoga Springs, New York and the Rhode Island School of Design. Osgood’s artwork is part of numerous collections including the Bill and Melinda Gates Foundation in Seattle, Washington; Nordstrom Inc.(in multiple states); Legacy Emanuel Hospital in Portland, Oregon; Meyer Memorial Trust in Portland, Oregon; MOMO International in New York; Oregon History Center in Portland; Portland Art Museum in Oregon; and the Jordan Schnitzer Museum of Art.